Next Saturday, 4 August, the fungi book that Joy Clusker and Ray Wallace have been working for over 3 years will be launched. 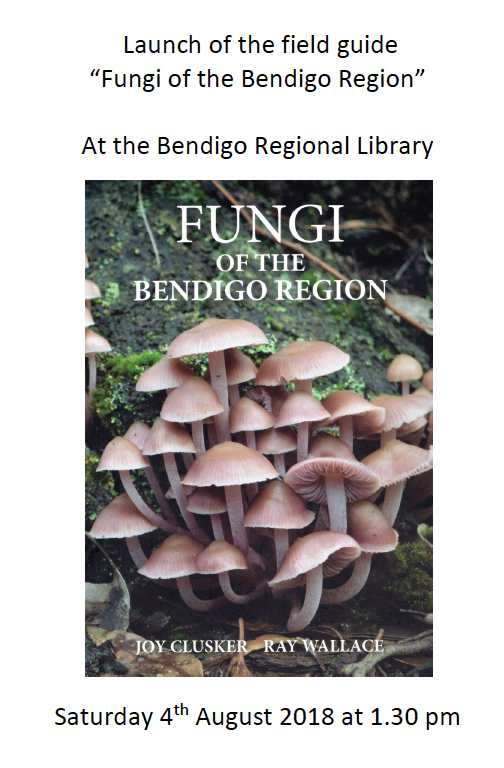 Fungi of the Bendigo Region covers the area from Kamarooka in the north to Mt Alexander in the south. There are approximately 300 species featured with short descriptions and photos for identification. The guide can be carried in a back pack. Hello! I was wondering where in the region we can purchase a copy of this book? Thank you! We hope to have copies for sale at the upcoming FOBIF AGM [see our post for details]. Otherwise contact the authors at joyclusker@icloud.com It’s not available in bookshops at the moment. It’s a terrific book–well worth anyone’s $20.